WASHINGTON — The U.S. will not send American troops back to Iraq, even as violence threatens to destabilize the entire country, said U.S. Secretary of State John Kerry. 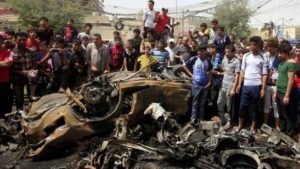 Reuters reported that al-Qaeda elements have retaken parts of the city of Fallujah, in what has become a serious religious and ethnic civil war since the Americans withdrew from the country. Kerry said that the Iraqi government will continue to receive U.S. aid to fight al-Qaeda forces in Iraq, but will not directly intervene in the Middle Eastern country. But, the al-Qaeda militants have taken Fallujah and Ramadi, which are in the region close to the Iraq-Syria border. Now the Iraqi government led by al-Maliki (and is Shi’a) is on its own as the Sunni al-Qaeda forces seem to have an upper hand in the country.